A point against a Guiseley side newly relegated from the National League and full of seasoned performers is not to be sniffed at, but the fact that Brakes were in front twice made it feel a little like a defeat, writes Paul Edwards. This game was not a classic by any stretch and, like the supporter, both managers will have been left perplexed at some of the decision-making by the match officials at times, but the fact that Leamington earned a point after their first defeat of the season on Tuesday has to be viewed as a positive step. The Lions may have come into the game with only two points from their opening four games back at this level but they were certainly on the front foot in the opening ten minutes while not really troubling the Leamington goal. Connor Taylor registered the first effort for either side, his looping drive dropping past the upright, while marauding left-back Niall Heaton crashed a powerful shot just over the bar from distance for Guiseley. 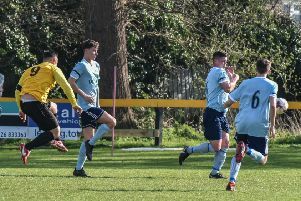 Jack Edwards looked to be in with a chance following a long throw into the penalty area but he was unable to get enough purchase on his effort and the ball was cleared from danger. With constant stoppages fracturing play there was no real rhythm to the game but the hosts were looking the more likely to make the breakthrough. Connor Taylor struggles to get a decent connection on the ball. Guiseley keeper Jon Worsnop conceded a corner in comical fashion, somehow sending a simple clearance out of play but he redeemed himself from the resulting dead ball, holding on to Kieran Dunbar’s well-struck effort. Joe Clarke cut out a pass forward and found Callum Gittings, who in turn shipped the ball to Edwards. He clipped a superb pass into the path of Matty Stenson, who was calmness personified as he nudged the ball past the goalkeeper with his first touch before slotting his fourth goal of the season into the empty net from an acute angle. The visitors were using their long throws to cause Leamington problems in the penalty area but as half-time arrived Paul Holleran’s side looked comfortable, which made it all the more frustrating when the visitors hauled themselves level just two minutes after the restart. Breeden failed to hold on to Curtis Morrison’s ball into his six-yard box but looked favourite to reclaim it only for it to slip from his grasp before being bundled into the net by Paul Clayton. Leamington composed themselves and went forward once more. A swift counter attack saw Dunbar find Edwards in space on the left, who in turn released Stenson, advancing out on the right, with a fine arcing pass that cut out the retreating defenders. The striker got a powerful effort in but it was deflected over the bar for a corner. More good play from Dunbar saw him trick his way into the area on the right before finding Taylor in the centre, the attentions of Cliff Moyo putting him off a little as Worsnop claimed the ball. Junior English put Leamington ahead for a second time in the 65th minute, doing well to reach Breeden’s free-kick from and holding off Moyo before burying a low drive across Worsnop and into the far corner. Dunbar felt he had a shout for a penalty when he was sent tumbling as he latched onto Taylor’s ball into the box but his pleas fell on deaf ears. Guiseley threw on on Rowan Liburd and the experienced Kayode Odejayi to boost their chances of a second equaliser and Liburd came close with his first involvement, driving a shot into the side netting. Breeden then experienced a similar moment to the one his opposite number had in the first half, spilling a seemingly harmless shot behind for a corner before soaring above everybody to pluck the ball out of the air as it was delivered into his six-yard box from the right. Two injury-time goals had left things shaky before Anthony Dwyer’s intervention against Bradford last Saturday, while an 85th minute goal deprived Brakes of a deserved point at Hereford on Tuesday and they were to be denied two more here as Guiseley plundered an 89th-minute leveller, Liburd sweeping home from close range from a dangerous right-wing cross into the centre from Reece Thompson.